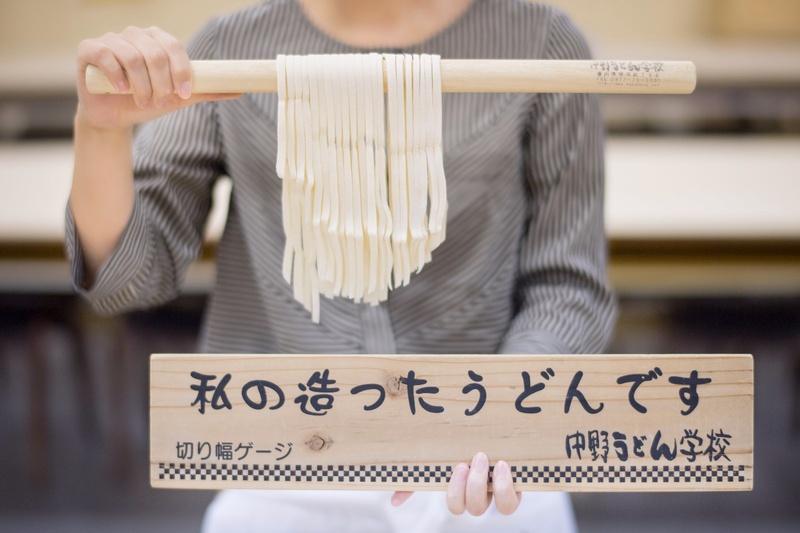 Sanuki Udon noodles are known as the soul food of Kagawa prefecture. 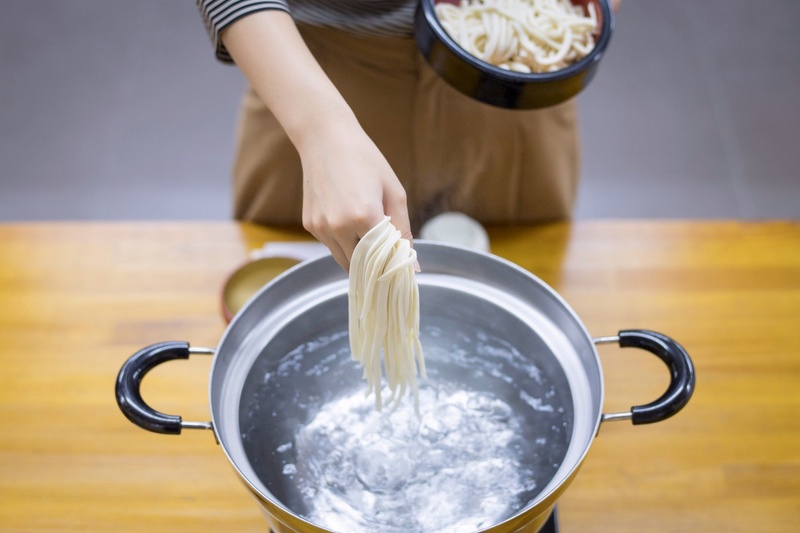 According to a survey conducted by the Ministry of Internal Affairs and Communications (MIC), Takamatsu is the top ranking city in Japan in terms of the amounts spent both on udon and soba noodle purchases, and on eating out at udon and soba restaurants! 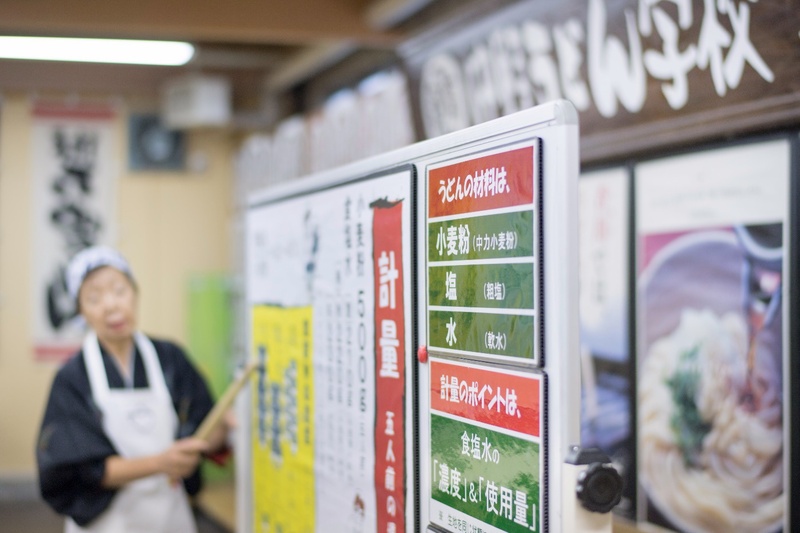 Many travelers both from within Japan and overseas visit the city with the aim of eating udon. 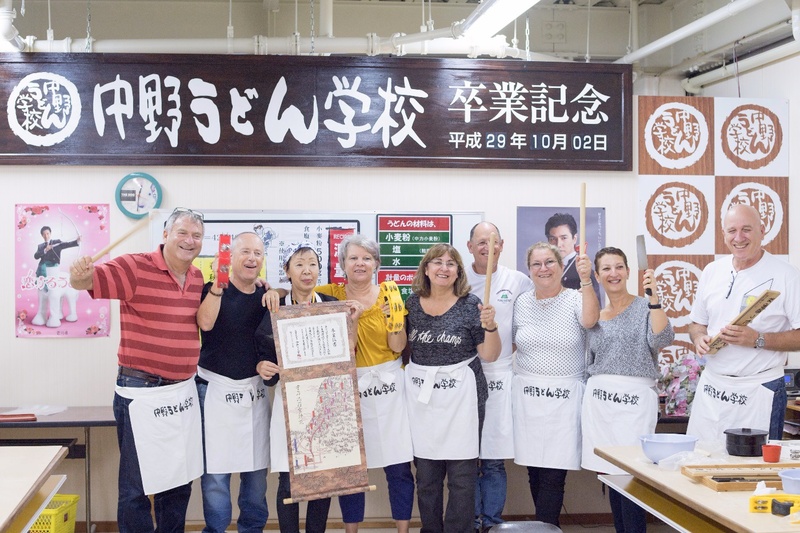 This time, we visited a making udon school with a group of Israeli tourists, who came to try their hands at making authentic udon noodles. “Welcome everyone. 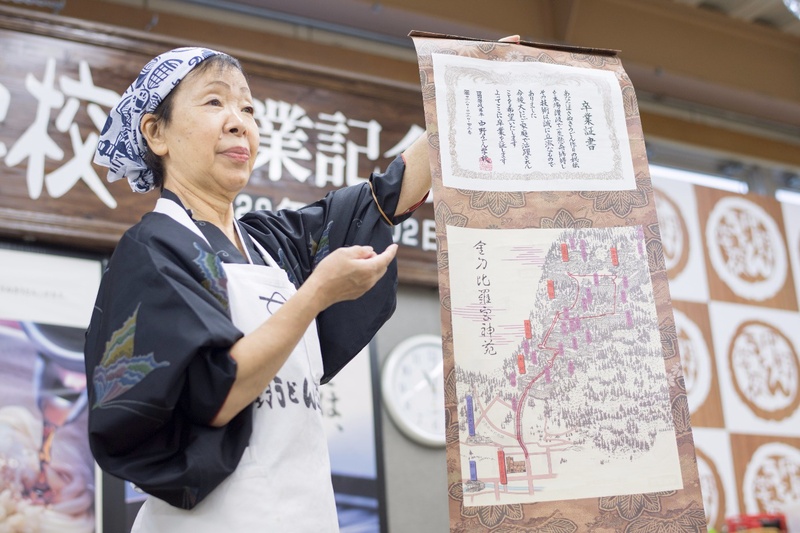 Thank you for coming.” We were greeted by veteran udon-maker Mrs. Fumie, our teacher for the day. Everyone braces and becomes more serious as we put on the aprons that we are handed, all emblazoned with the school logo. 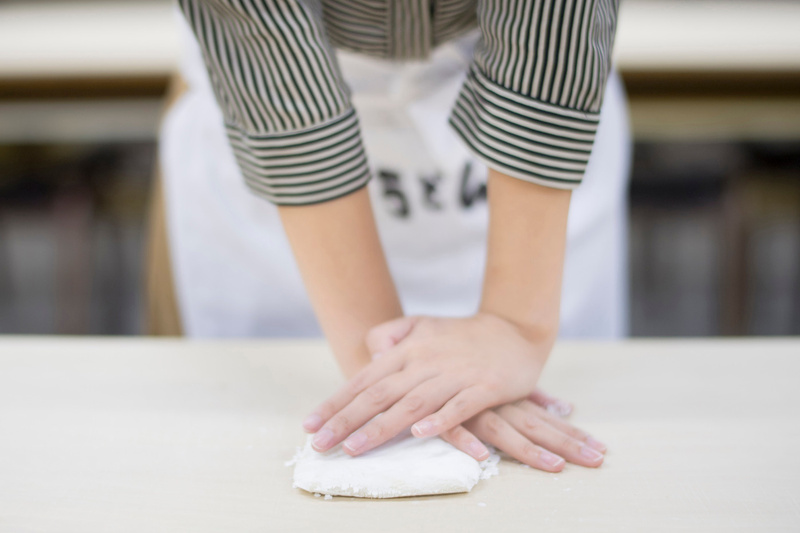 We must use not only our hands, but our whole bodies, as we knead and flatten out the dough. 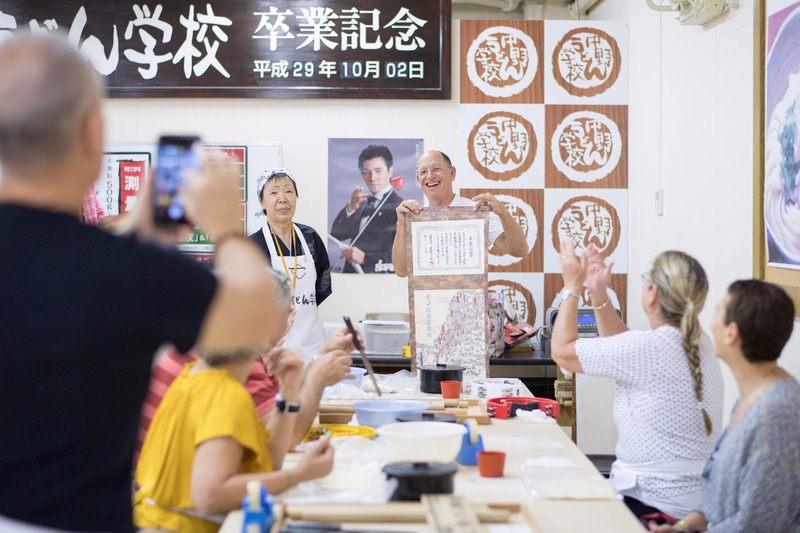 Looking around, it seems as if the individual personality traits of the people making the noodles start to manifest themselves from around this part of the process. 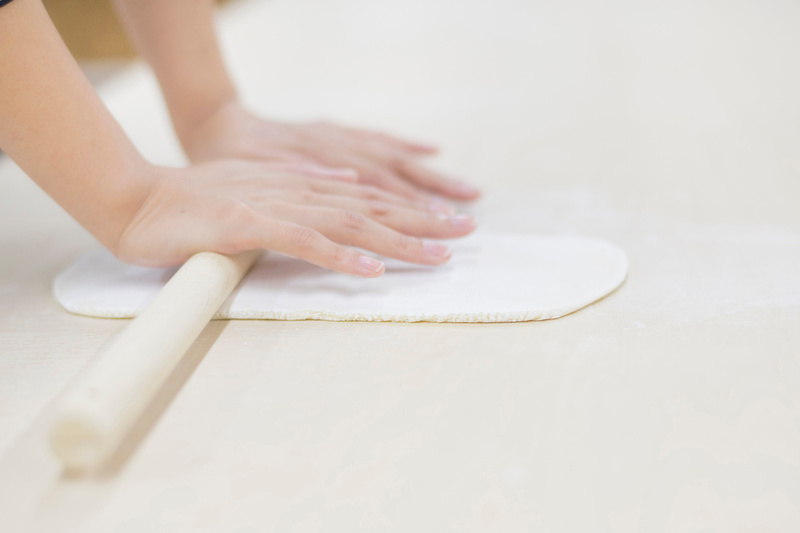 The dough is wrapped tightly around the rolling pin, and spread out to an even thickness. Mrs. Fumie's explanation using an illustrated board is easy to understand.Around 5 or 6cm is the easiest thickness to cut. 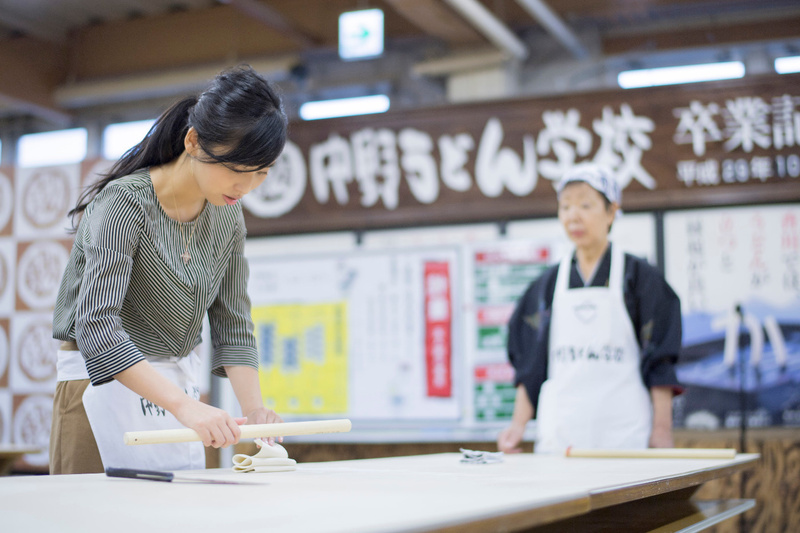 It seems that a traditional Japanese hand towel is handy for a lecture on dough rolling. 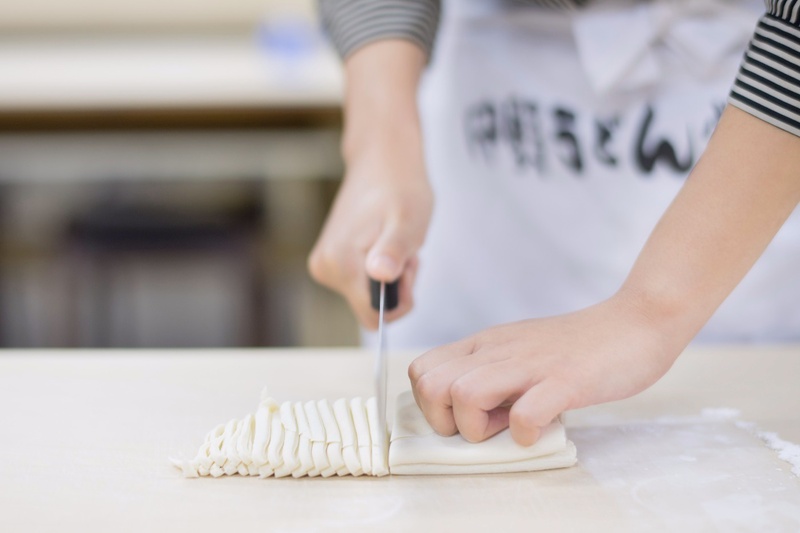 After the dough is stretched out, the next task is to cut it using a kitchen knife. The stretched dough is folded into several layers, like an oriental folding screen. 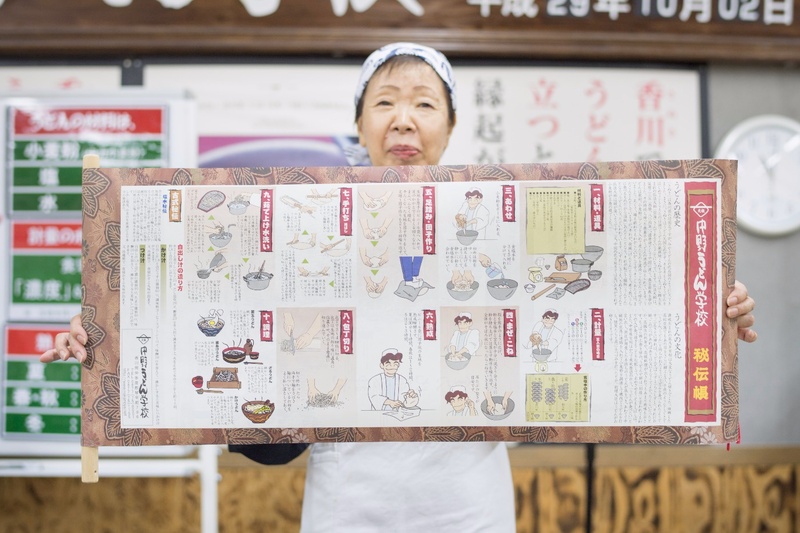 “The noodles swell up and expand when they are boiled, so let’s do our best to cut them slightly thin,” says Mrs. Fumie. 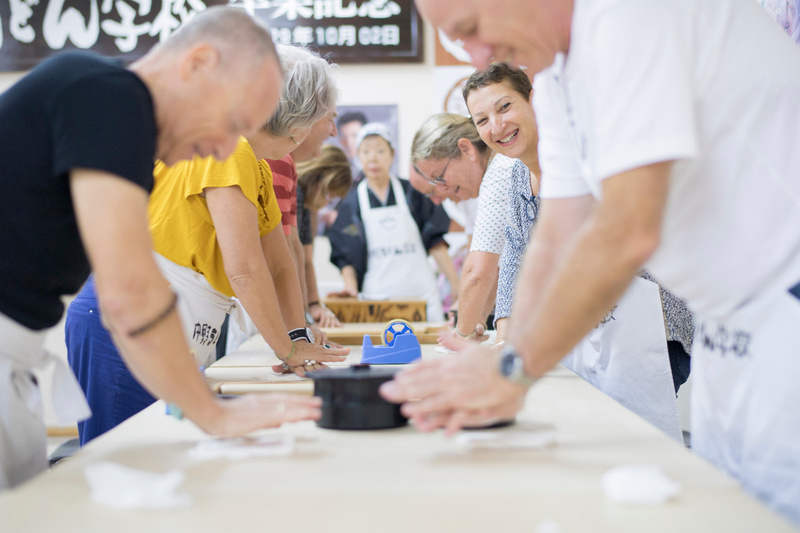 The participants carefully cut into the dough with their knives. Everyone is pleased to see their dough transformed into noodle shapes. We start to feel just like real udon chefs. “OK, let’s stop here for a moment to take photos. Hold this!” Everyone scrabbles frantically to take snapshots. After the cutting is finished, the noodles are placed in a container to rest for a short while. Next, everyone listens keenly to Mrs. Fumie’s udon lecture. 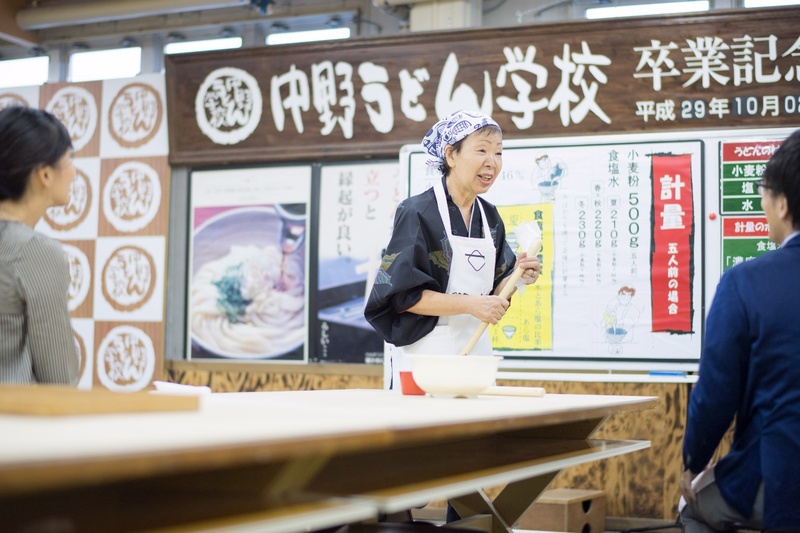 Udon can be made with only three simple ingredients: flour, salt and water. According to Mrs. Fumie, however, the amounts of salt and water used—and also the time that the dough is left to mature—all vary significantly depending on the season. After hearing about udon culture and important dough-making points, we move on to making our own dough. 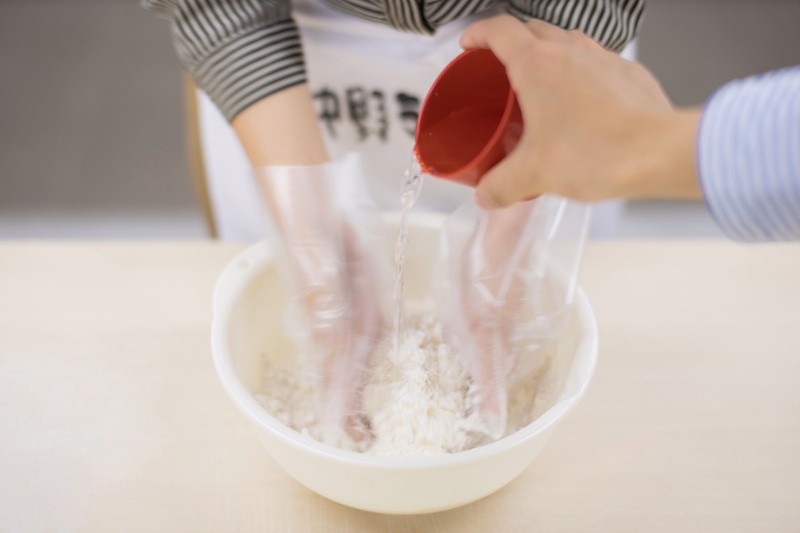 Salt water is added to flour in a bowl, and the mixture is mixed together. The key to success is not to add it all at once, but a little at a time. All of a sudden, Mrs. Fumie pulls out a set of colorful-looking tambourines! As the participants are feeling somewhat bewildered, she says, “Let’s mix the dough quickly. Music, start!” Pop-sounding background music suddenly begins to play! When this happens, there’s nothing for it but to answer to the support of the tambourine-shaking supporters around you. Kneading the dough in time to the rhythm and finishing it off into a single ball takes a surprising amount of strength. Apparently the background music used varies depending on the age and nationality of the participants. “OK. Now we will put the dough into a plastic bag and knead it with our feet. 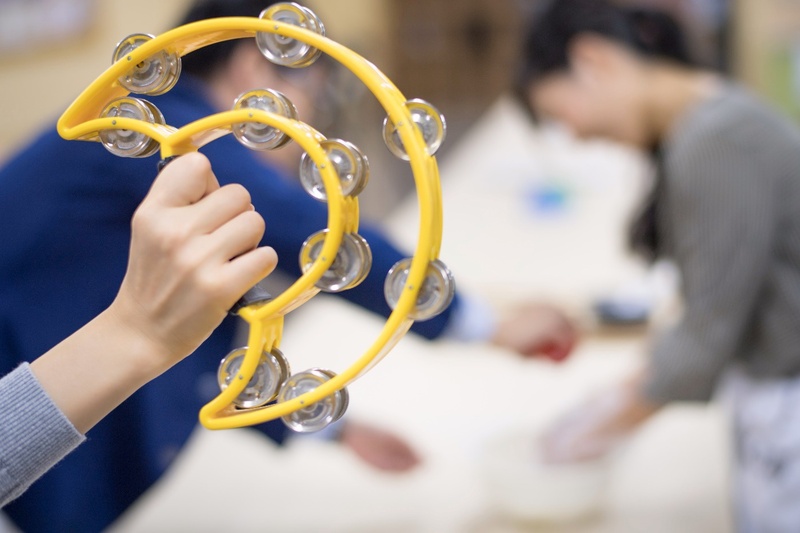 Music!” Without a moment’s rest, we begin the next step of treading on the dough to knead it further and give the udon its characteristic chewy texture. 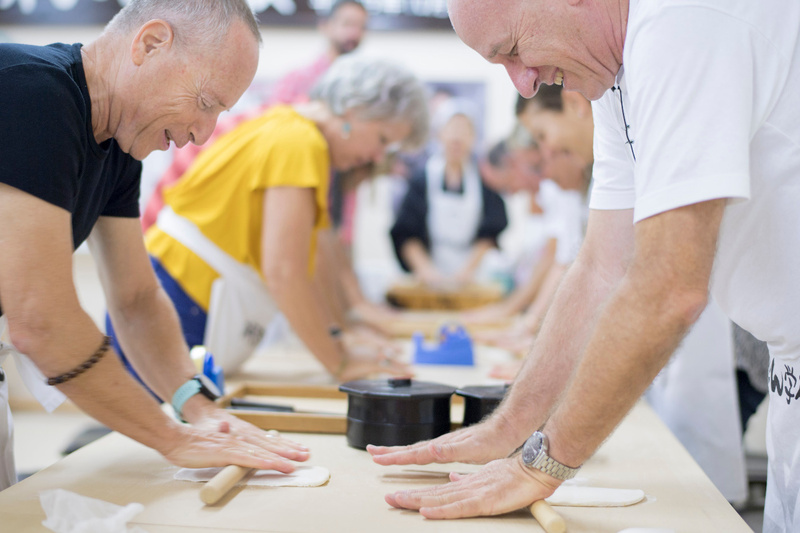 The participants begin to knead the dough with their feet in time to a popular dance track, and then jump along to the chorus. For around six minutes, the classroom is overcome with a feeling of oneness similar to one might experience at a concert venue, as the workshop heads towards its exciting climax! The participants are out of breath. 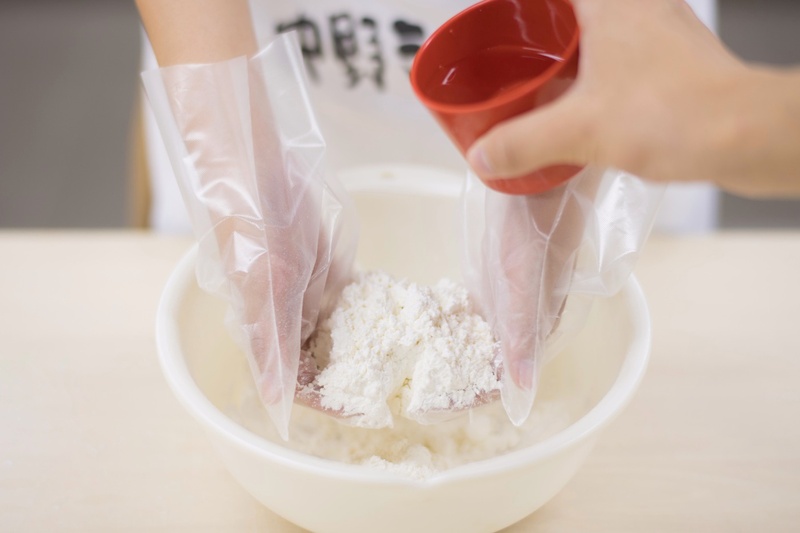 The finished balls of udon dough are to be taken home as souvenirs for later use, they are kept inside plastic bags to prevent them from drying out, and allow them to mature. Once participants have completed the course curriculum, they can receive a graduation certificate from the teacher. “You all did well and managed to have fun making udon together. Today everyone gets top marks!” she says. 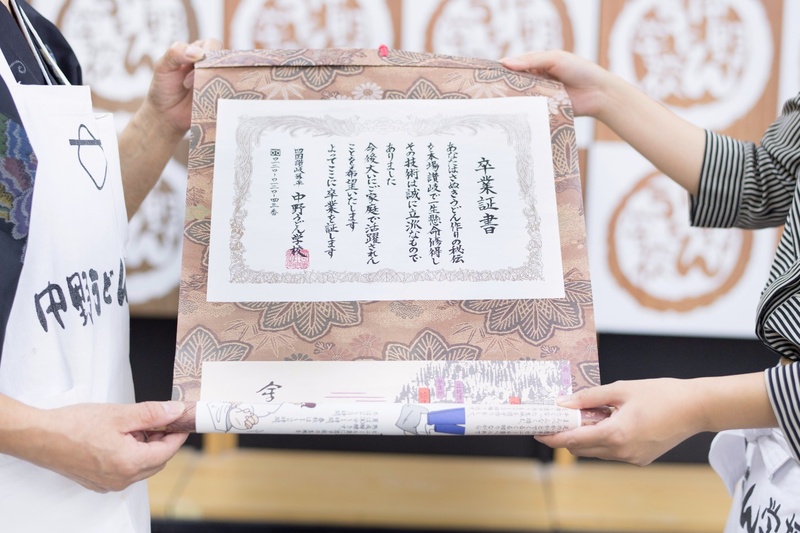 In fact, the hanging scroll style graduation certificate is a set that also includes the secret recipe learned during the day’s lesson. An English version is also available. I had heard that the rolling pin was also part of the set, but I never would have thought it would come out of a place like that! I’ll have to do some revision right away with my freshly-made ball of dough when I get home. Finally comes the avidly-awaited tasting time. The noodles that we cut and left to rest earlier on are boiled in a pot, then eaten simply with a specially made dashi sauce. 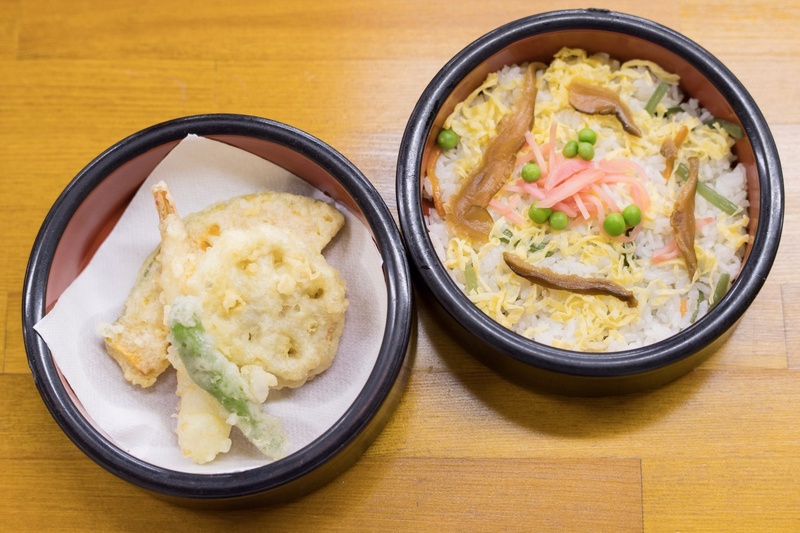 This style of freshly boiled noodles, served without straining, is known as Kamaage Udon. The noodles are soft, puffy and delicious, with a bouncy freshly-boiled texture, and the unique chewiness of Sanuki Udon. The dashi has a pleasing aroma, and the condiments are pleasantly fragrant too. The combination makes for a noodle dish so delicious that your chopsticks won’t stop until it’s all gone. Freshly cut and boiled noodles that you have cut and prepared yourself seem to taste better than those served any famous restaurant. I was also sure to eat all of the optional tempura and chirashizushi (a bowl of sushi rice with assorted slices of raw fish scattered on top). 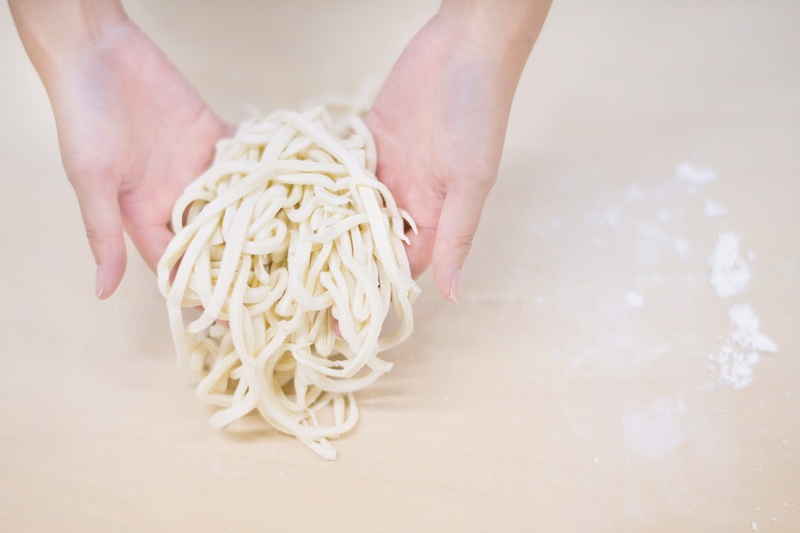 The fun of preparing hand-cut udon noodles is truly universal, and can be enjoyed by anyone. 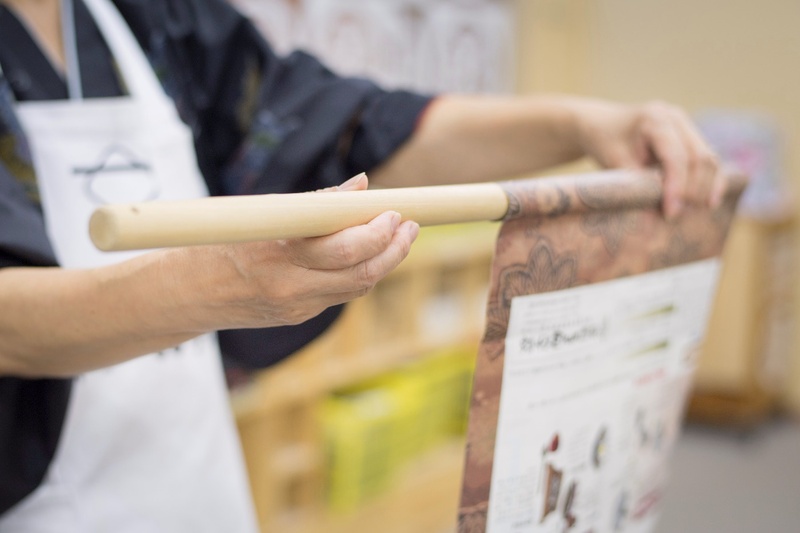 Participants receive their own rolling pin and secret recipe guide to take home with them. 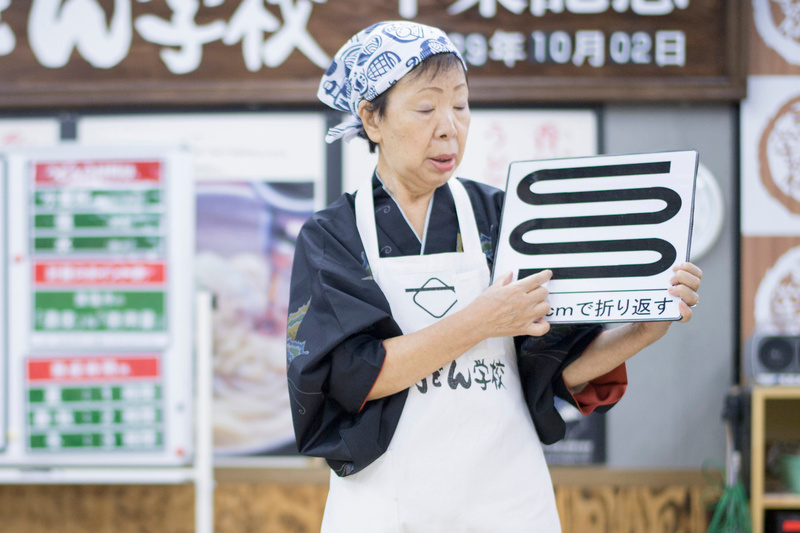 Why not try a real udon-making experience in Kagawa, the authentic home of Sanuki Udon?